With summer just around the corner, dreams of laying poolside with a cold drink in hand are fast becoming a reality – that is, of course, if you have a swimming pool. If you’re not yet the proud owner of pool, not to worry. With more and more modern apartment developments boasting incredible amenities emerging onto the scene in Sydney, resort-style living is becoming increasingly attainable. The private rooftop garden at Iconic is a picture of tranquillity and summertime indulgence. The pool is perfect for a refreshing dip on a hot summer's day – and with luxury lounge furniture and BBQ facilities on the rooftop as well, it will quickly become your own little summer sanctuary. At Esplanade Norwest, the residents pool club is a focal point of the enhanced living experience on offer. Once you’ve had a dip, sink deep into your favourite book on a deck chair – or go for dinner at the site’s fine dining restaurant on the lakeside boardwalk. Highline Westmead offers a full and well-balanced lifestyle – which, in Sydney, includes a swimming pool right outside your front door. The development’s stunning pool is surrounded by sundecks and green spaces, making it the ideal spot to soak up the sun. It comes as no surprise that a development named Waterfall includes a couple of swimming pools. 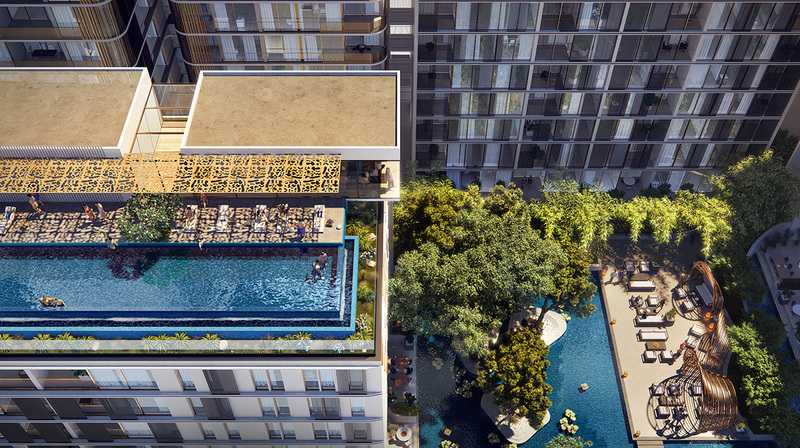 Residents can choose to make a splash in the infinity rooftop pool above or freestyle it in the ground-level pool below. Is it time you lived in a place with a pool? Enquire about these luxury Sydney apartments now and you’ll soon discover you don’t need to be swimming in cash to make your pool-owning dreams come true. To check out more of our off the plan apartment developments in the Sydney area (warning: not all of them have pools), click here.